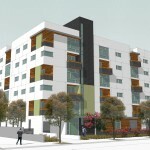 American Communities is proud to announce its Ground Breaking for The Gordon, a 21-unit affordable housing community, located at 1555 North Gordon Street in the heart of the Los Angeles Hollywood Community at 10:00 am on Monday, June 11, 2012. Eric Garcetti, Councilman for the 13th Council District will be the key note speaker. The Gordon will be a LEED Gold certified and ADA compliant building upon completion in 2013. The Gordon is designed as a central courtyard building which features gardens and a community room opening to the heart of the building. The central courtyard will feature lush landscaping, a BBQ area, a children’s play area and sitting areas for the residents to congregate, relax and enjoy the outdoors. To reinforce the connection of the building to the street, the lobby entry is prominently placed at the ground level of the Gordon Street façade. By using large areas of glazing at the community room and entry lobby, the transparency and connection between interior activity and the community is emphasized. A patio is also featured off the ground level community space. The building’s exterior design is a simple modern form. The façade highlights the large private balconies of the residential units which creates their own rhythm in the building. The Gordon’s exterior will feature smooth painted stucco, board siding and metal accents in the balcony railings and roof eves. The units have been generously designed with several amenity features and range in size from one-bedrooms’ of 603 feet, to two-bedrooms’ of 890 feet, and three-bedrooms’ up to 1,140 square feet. All units have private balcony space off the living room. The kitchens contain plenty of storage space and feature an energy star rated refrigerator, dishwasher and range. The 2-bedroom units have an extra half-bath for function and convenience while the 3-bedroom units feature two full baths. 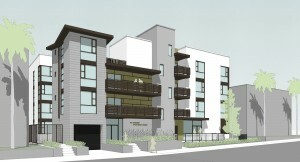 The Gordon was financed by City of Los Angeles Housing Department and 9% Tax Credits and, as such, will feature a range of affordably priced units. Income limits will apply and qualification will be required.